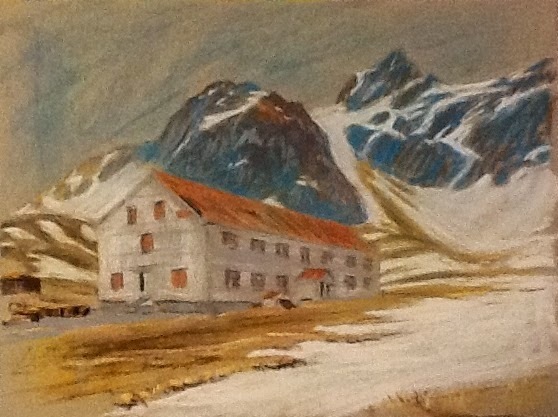 it's been a long time since I last posted on this blog, but I've been trying out pastels so I thought I would upload a quick sketch I did of the barracks at Grytviken. It's quite an impressive building, sadly in a poor state of repair, but separate from the other buildings and therefore quite easy to isolate in a picture. Pastels are quite fun, I'm finding, and great for an impressionistic approach. Detail is very difficult to achieve, so I'm forced to concentrate on the bigger shapes. With a very limited range of colours, I'm also having to revert to colour mixing theory to get the subtle greys etc. 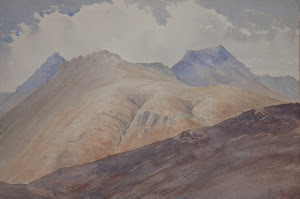 that are much easier to achieve with watercolour. I would love a comprehensive range of sennelier colours, but I'm afraid they will break the bank, so will have to make do with what I have.